Cement paint per person in roll or spray with machines designed for this, with polymer to suit different climatic factors, produced according to German specifications DIN18550. 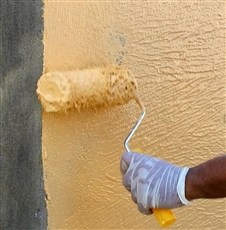 Taiba Cout 607 color cement paint added to water only ideal for exterior and interior finishes applied by using a roller over the normal cement layer or walls, concrete ceilings or gypsum boards to give a wonderful decorative shape. After the mixing of the water according to the quantity of water specified in the technical bulletin and the good mechanical stirring using a suitable feather that the period of continuous flipping is not less than three minutes. The individual shall be properly lubricated on a surface prepared for paint, free of dust and gypsum residues and sprinkled with cold, cold water. The material shall be distributed well on the surface in two successive directions to ensure good coverage and color consistency. Thickness of the layer: 15 - 25 mm. Mixing water: 12 ± 25% per 50 kg of powder. Operating time: 30 minutes at 25 ° C (low operating temperature with high temperature). Indicative consumption rate: 20 kg / m² for thickness 15 mm.